The Lord said, "The harvest truly is plentiful, but the laborers are few. Therefore Pray the Lord of the harvest to send out laborers into His harvest (Matt 9:37,38)." In faithfulness to this commandment, I the undersigned, as a new member of the St. Innocent of Alaska Missionary Prayer Society, make the commitment that on a weekly basis, (preferably Wednesday evening or Thursday, the day the Orthodox Church remembers the apostles,) I will sing the Akathist with Molieben to St. Innocent of Alaska, either at home before my icon corner or in the church, beseeching his fervent prayers before the throne of God for continued apostolic and missionary labors in the northern vineyard of Alaska. I further promise that I will work in a spirit of unity and love, laboring together and praying together, with all Orthodox Christians of all jurisdictions, for joint missionary work, in the One, Holy, Catholic, and Apostolic Church. All forms will be processed and forwarded to Geoff Whiteman. We are so thankful to those who pray for Alaska as members of the St. Innocent of Alaska Missionary Prayer Society. The following list indicates previous and current praying members. Your prayers are bringing miracles to Holy Orthodoxy in America's Great and Holy Land. We see this with the education of new clergy, the development of programs for youth, new projects with IOCC, church building and increased support for the projects of Outreach Alaska. 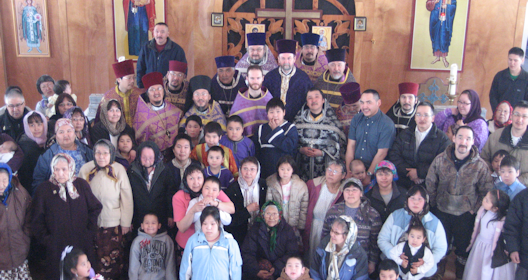 Please join these people and others in prayer for Holy Orthodoxy in Alaska. What is the prayer society? The St. Innocent of Alaska Missionary Prayer Society supports the growth of the Holy Church in Alaska with weekly prayers and mutual encouragement in the love of Jesus Christ. The Society was officially inaugurated in 2000 at St. Innocent Orthodox Christian Cathedral in Anchorage, marking the 130th anniversary of the first meeting of St. Innocent's own Missionary Society. Membership in the St. Innocent of Alaska Missionary Prayer Society is open to all Orthodox Christians of all jurisdictions, and the cost of membership is simple: we must pray! St. Innocent, in his address at the first organizational meeting of his own missionary society in 1870, asked: "What then shall we do? How ought we proceed when, in the words of the Gospel, the harvest is great in our country (i.e., many remain unconverted to Jesus Christ)?" St. Innocent then answered, "Pray to the Lord of the harvest. Jesus Himself teaches us (Matt 9:38); thus, first and foremost, we must pray." 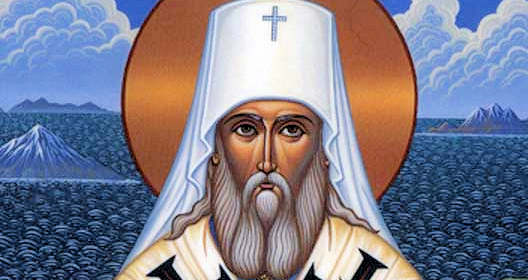 Orthodox faithful who desire to participate should make the following commitment: once a week (preferably on Wednesday evening or Thursday, when the Church remembers the Apostles), either at home or in the church, to sing the Akathist with Molieben to St. Innocent, Enlightener of Alaska and Apostle to America, beseeching his fervent prayers before the Throne of God for continued apostolic and missionary labors in this northern vineyard. With Prayer of the faithful rising like clouds of incense over these holy mountains and glaciers, where so many saints have trod, surely the Lord will hear our cry! 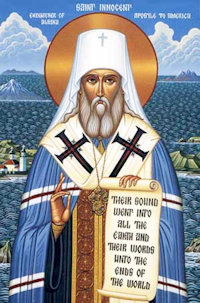 Respond to the call of our fellow countrymen, heirs to the spiritual legacy of St. Innocent, as they struggle in America's Holy Land against the evil one, treacherous weather, harsh subsistence lifestyle, and poverty to preserve the Orthodox faith. Provide hope to the Orthodox faithful of Alaska through an organized effort of prayer and sharing our God given treasures: financial means, time, talent, energy, experience, and ability. Thank you to the Virginia H. Farah Foundation for their continued support of Outreach Alaska. The Farah Foundation has provided a grant for us to support St. Herman Theological Seminary. Thank you to International Orthodox Christian Charities. © 2015 Outreach Alaska, an institution of the Diocese of Alaska.